What is a Differential Market? Where Can I Access Live Differential Prices? Where Can I Get Live Differential Charts? Where Can I Practice Financial Spread Betting on Differential Markets? Important: Please note that when both markets in a differential e.g. the Brent crude and US crude, have very similar prices then the market may not be available. In the world of spread betting, a 'differential' market is just the difference between two other markets. For example, the Wall St 30 / UK 100 differential is the difference in value between the Wall St 30 stock market index and the UK 100 stock market index. If the underlying Wall St 30 index is currently trading at 18,550 and the underlying UK 100 index is priced at 6950 then Financial Spreads might offer a Wall St 30 / UK 100 differential market of 11,598.1 - 11,601.9. Therefore, clients could spread bet on the difference between the two stock markets getting wider than 11,601.9 or getting narrower than 11,598.1. Thinking of this in another way, the differential lets you speculate on the relative performance of the Wall St 30 versus the UK 100. If you thought that the US stock market would perform better than its UK counterpart then you could spread bet on the differential to increase. On the other hand, if you felt that the UK 100 would outperform the US market then you could choose to spread bet on the differential to decrease. Investors can also trade on more than 1,000 other spread betting markets including individual stock market indices and a variety of shares, foreign exchange pairs and commodities. Financial Spreads offers investors real-time pricing on over 1,000 markets like stock market differentials and a wide variety of other indices, foreign exchange, commodities and equities markets. When trading with Financial Spreads investors can look at a professional level charting package for more than a thousand financial markets. A variety of time intervals - 15 minutes, 2 hours, 1 day etc. 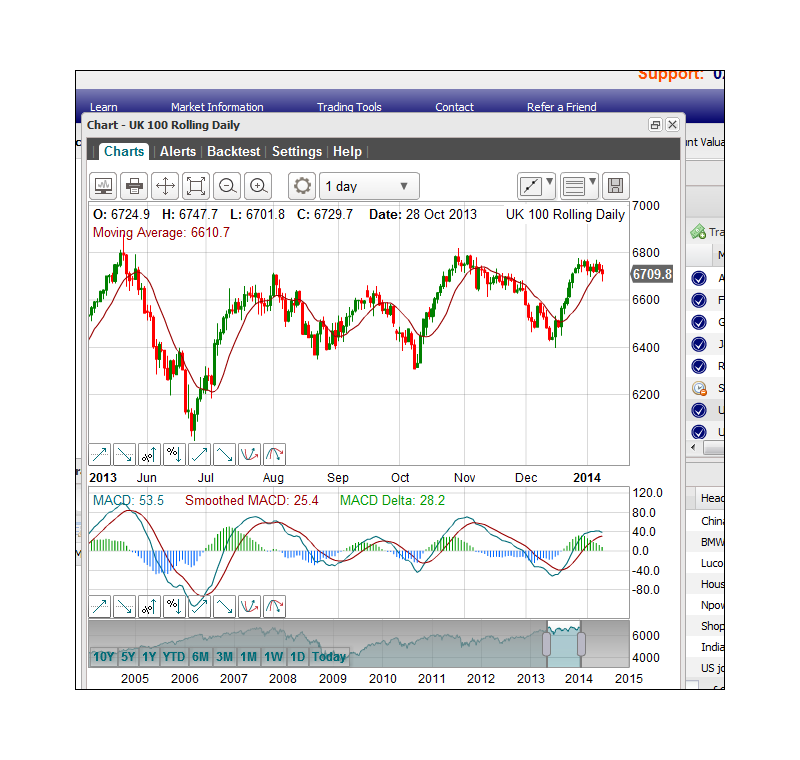 Technical indicators and chart overlays - Moving Average, RSI, TSI etc. On the settlement date for this March futures market, 20 March 2015. This is a 'Futures' spread trading market and therefore the bet will close automatically on a set expiry date. Having said that, you can usually close your position, during trading hours, before the expiry of the contract. Note also that this futures market does not have daily financing fees. Traded Units Bets on the Germany 30 / France 40 differential market are priced in £x per point. E.g. if the Germany 30 / France 40 differential moves by 40 points then you would lose / win 40 times your stake. Stake per Unit You choose how much you would like to risk per point, e.g. £1 per point, £4 per point, £20 per point etc. Simplified Trading Example If, as an example, you had a stake of £3 per point and the Germany 30 / France 40 market moves 33 points, you would lose/win £3 per point x 33 points = £99. When the market expires, 20 March 2015. Time to Take Your Profit? You can opt to leave your trade open, letting it run to the expiry date, or close it, i.e. close your trade to lock in a profit. For this example, you opt to settle your bet by selling the market at 6848.9. The Germany 30 / France 40 differential drops. Time to Limit the Loss? At this point, you could choose to leave your trade open, letting it run to the settlement date, or close it in order to limit your loss. In this case you choose to let your position run until expiry. The contract finally settles at 6748.3. Take a Profit? At this point, you may decide to keep your trade open, and maybe let it run to the settlement date, or close it and lock in a profit. For this example, you opt to let your position run until the market expires. The contract settles at 6725.5. Time to Limit Your Loss? You could opt to let your position run to the expiry date or close it to limit your loss. In this instance you choose to close your position by buying the market at 6846.1. Financial Spreads provide a free Practice Account which means you can test new trading strategies, practice trading, analyse the charts and test trading orders on differential markets. 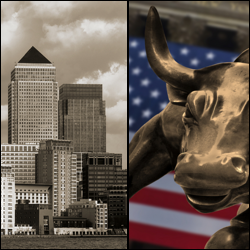 The Practice Account has a large selection of markets such as FX, commodity markets, equities and index markets.